Coach Andrew Dodd has coached basketball in the US and abroad over the past 25 years. He has worked at the high school, club and national team levels. He is currently residing in Doha, Qatar. First read the Slice Offense page. 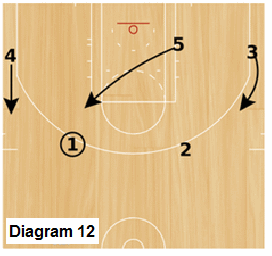 This page presents a number of quick hitter and baseline out-of-bound plays to complement the Slice Offense. Make sure it is seamless... Through a simple hand signal we can run the play right out of our Slice Offense formation at any time... at the beginning or middle of the shot clock. I hate calling a play and having players scramble around to get in specific spots/positions... more time is wasted. 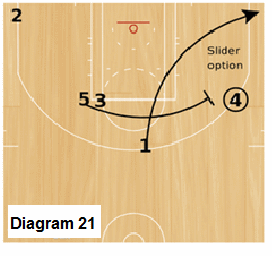 Offers play options and possibilities that the Slice Offense does not. 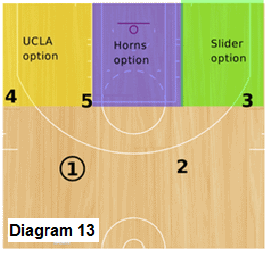 Three areas in particular are the posting of our 5 man (not an option in Slice), screening for players to get open on the perimeter (rather than just drive and kick) and various screen types (UCLA, Horns, Flex/Hickory, Swing/Wheel, etc). Provides options for all players to make a play... and accentuates their strengths. Especially highlighting your best offensive players. We have had so much success with this play, we have often run it as our secondary break. The signal for this play is simply a "thumbs down" from the playmaker. As you can see our players are in the Slice Offense formation. 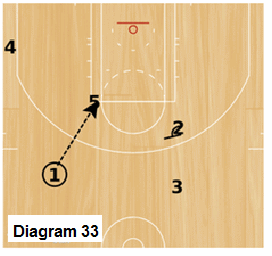 After 1 signals for the play, 2 cuts across the lane to help set up a double screen with 5. 3 flashes to the Point to receive the pass (Diagram 1). 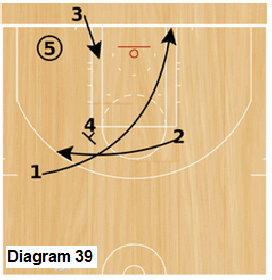 By clearing the right side of the floor, 3 has a great opportunity for the backdoor if overplayed (Diagram 2). 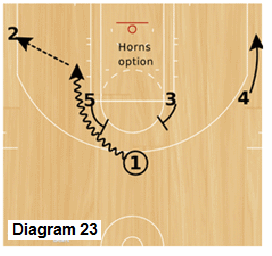 Let's say 1 passes to 3 (Diagram 3)... We then execute a "Hickory" screen on the baseline (Diagram 4). I call it a Hickory screen because about 15 years ago at a Clemson team camp, my team kept getting killed by this screen from a team from Hickory, NC. They simply ran it back and forth in a continuity motion (similar to flex). 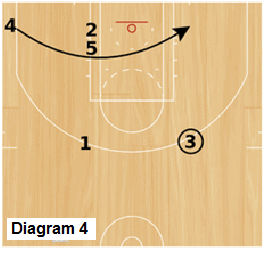 After the pass, 1 then helps set a staggered screen with 5 for 2 (Diagram 5). 2 pops the stack and receives the ball. 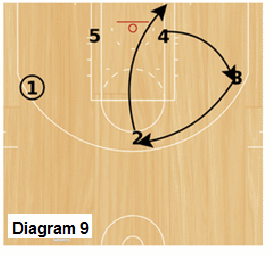 From there, 5 executes the Velcro action (remember, from the Slice Offense) with 3 and 2 (Diagrams 6 & 7). I ripped this play off from a continuity offense (Circle Offense) designed by the legendary high school coach, the late Coach Rocco from PA. I first viewed it when Coach Rocco brought this offense to Roswell High School in Georgia as an assistant and got a nice 20-win season out of a pretty mediocre squad. I really enjoyed going to Rocco's favorite pizzeria in Roswell to talk basketball and learned a lot from him. 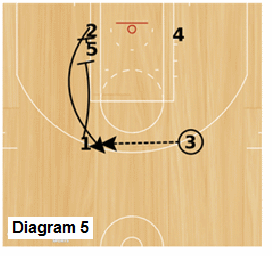 I use this play to post up our 5 as quickly as possible. The signal for this play is a fist. The action is simple. 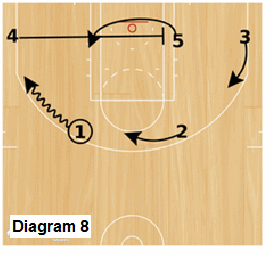 After the play call, 4 moves to set a screen for 5 (Diagram 8). We consider this a "small-big" screen as any of our perimeter players could be in that position to go screen for 5. This forces 5's defender to fight over the screen and not switch. Once 5 posts up, 2 cuts to the basket and then a circular pattern takes place on the weakside (Diagram 9). Even if an entry pass is made to 5, the weakside pattern continues. The cutters not only provide scoring options but also keep the help defense moving, denying any opportunity for the post double (Diagram 10). If the pass is made back up top, it is very easy to get right back into the Slice Offense (Diagram 11). This has been my favorite play. We call it Trips because it is basically 3 plays in one. I have actually run this as a primary offense for some summer leagues when we did not have time to install a standard offense. The signal for this play is giving the "ok" sign with your index finger and thumb. 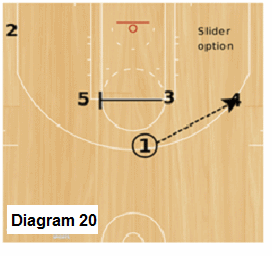 If you have a great scorer, then the ballside Wing position is a perfect slot for him (the 4 man in these diagrams). 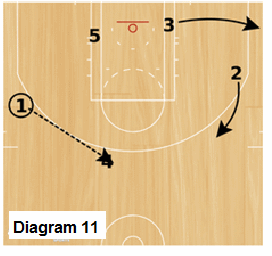 Once you make the signal, the wings move up to the foul-line extended and the 5 man would pinch to the ball-side... created a 2-3 high set (Diagram 12). 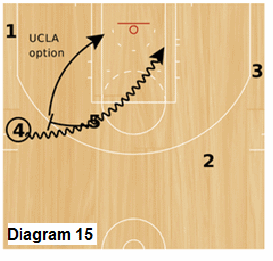 The first play option is "UCLA" which begins on the ballside... if this option is not desirable to playmaker, he dribbles to the middle and triggers the next two options which are "Slider" and "Horns" (Diagram 13). Let's start with the UCLA option. 1 has the option to pass to 4 or 5. 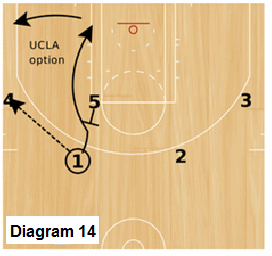 On the pass to 4, he makes a UCLA cut to the basket (Diagram 14). 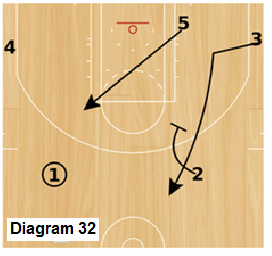 Then 5 executes a pick and roll with 4 and we get into Slice. (Diagram 15). 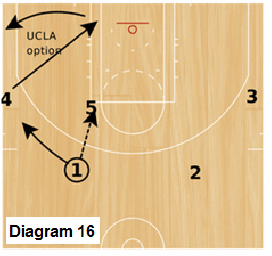 If 1 passes to 5, then 4 backdoor cuts and 1 fills 4 spot (Diagram 16). 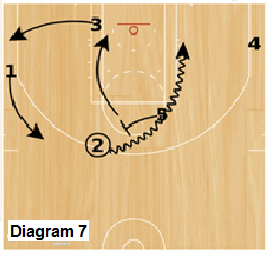 Again, from there 5 passes to 1 and they execute a pick and roll into the Slice offense (Diagram 17). 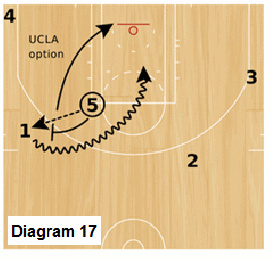 If the playmaker declines the UCLA option and dribbles to the middle, it immediately triggers our Slider option (a common NBA play). 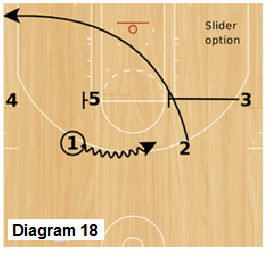 As 1 dribbles to the middle, 2 immediately backdoors and then fills the corner (Diagram 18). 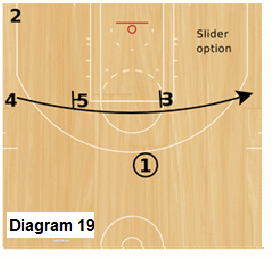 3 slides in and helps set up a stagger screen across the free throw line extended for 4 (Diagram 19). 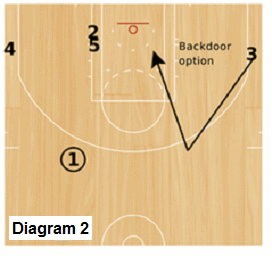 1 then passes to 4 (Diagram 20) and then backdoors and fills the corner (Diagram 21). 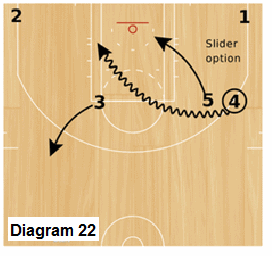 3 then comes across to screen 5 who then sets up a pick and roll on the ball (Diagrams 21& 22). 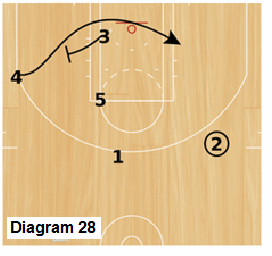 We like this action because the screen on 5 delays his defender and enables us to run a pick and roll without an additional defender to immediately hedge or double. 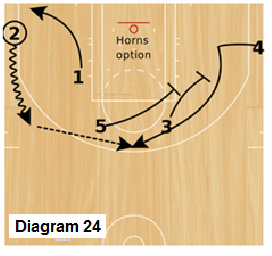 If 1 never passes to 4, he is now taking the last option which is the Horns option. He picks a side to attack and looks to drive and score (Diagram 23). If his drive is cut off, he kicks it out to 2 on the Wing. 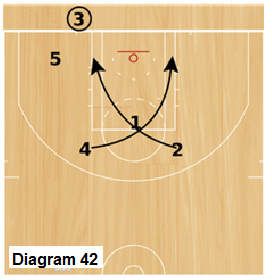 3 and 5 then set a staggered screen for 4 who receives the pass from 2 (Diagram 24). 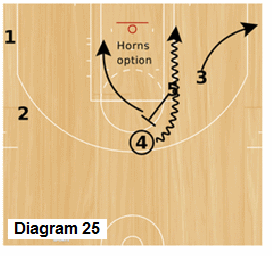 5 pivots and moves up to set a ball screen immediately for 4 and a pick and roll is executed (Diagram 25). This play is taken from Pinholster's Wheel Offense run at Oglethorpe. 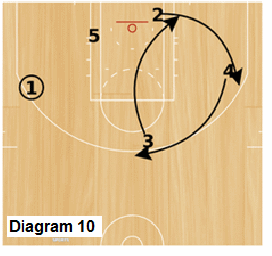 Instead of as a continuity, we simply run the basic motion into our Slice offense. It starts with 1 dribbling to the middle and 5 pinching to the ballside elbow. 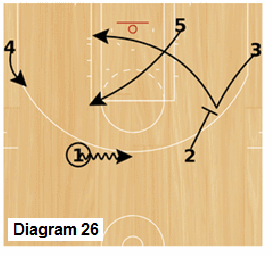 2 sets a down screen for 3 who then executes a Princeton backdoor cut to the basket (Diagram 26). 1 then passes to 2 (Diagram 27). 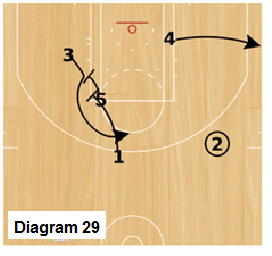 Right after the pass to 2, 3 sets a backscreen for 4 (Diagram 28). 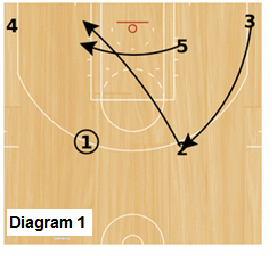 1 and 5 then set a staggered for 3 (screen the screener action) and 4 clears to the corner (Diagram 29). 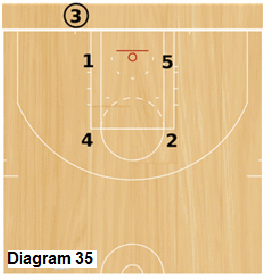 2 passes to 3 and a pick and roll is executed into the Slice offense (Diagram 30 & 31). 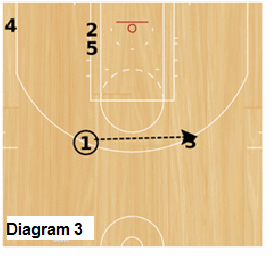 All offenses need a good lob play and this one has worked well for me in the past. It is actually the same action I use on a SLOB play as well. It is very simple but effective. 5 pinches to the ballside elbow and 2 screens for 3 at the same time. (Diagram 32). If 5 is overplayed, we have the lob option right off the bat as the backside of the Lane has been completely cleared out. 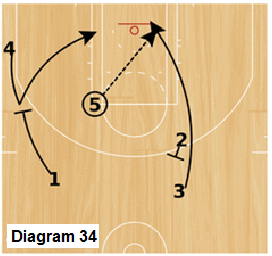 Once 1 passes to 5, 2 immediately pivots and rescreens for 3 (Diagram 33). 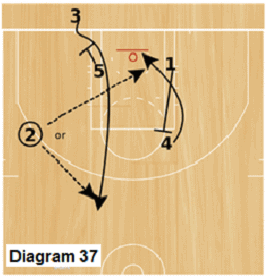 3 cuts off 2 for the pass... a secondary option is Princeton backdoor cut by 4 (Diagram 34). I like to use the same formation every time. I want it to be easy for players to remember and I do not want to give the play away based on the position of the players. The number one priority is to get the ball inbounds successfully... second, is to provide a scoring play. I want a quick scoring play, not an extended quick hitter. If the play is not successful, we simply run our Slice offense. The formation we use for all 3 plays is an extended box (Diagram 35). We like 4 and 2 to be a couple of feet above the foul line. We like 1 to be on the ballside block and 5 to be opposite, with 3 as the inbounder. 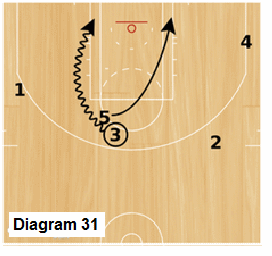 On Zipper, 1 goes across the lane to screen 5 (small-big screen, so we look for an easy score here first). 4 screens across for 2 who receives the ball (Diagram 36). 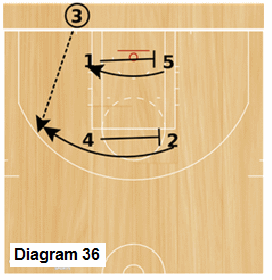 After inbounding the ball, 3 comes off the zipper screen set by 5 (Diagram 37), At the same time 1 sets a back screen for 4. 2 has the option to pass to 3 or 4. 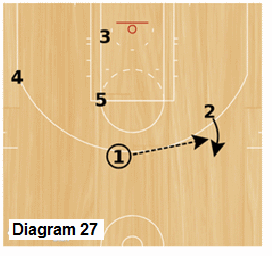 The next two inbounds plays have our 5 man flash across the lane to the short corner. 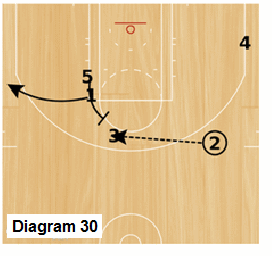 In this play, 5 receives the pass from 3. 1 has cut up the lane and curled around the screen set by 4 (Diagram 38). 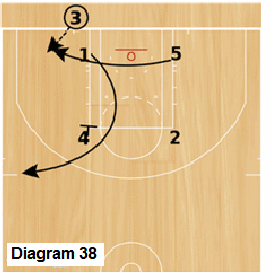 After 3 inbounds to 5, 2 flashes to the high Wing area... and 1 cuts off of the back of 2 and the backscreen set by 4 (Diagram 39). 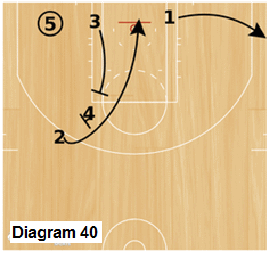 2 then reverses direction and uses the double backscreen set by 3 and 4 (Diagram 40). 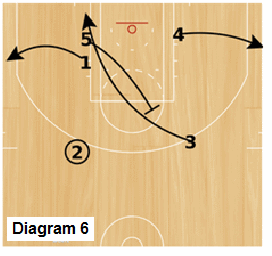 Basically, 5 has the option for two lob passes to the basket. This play has EARNED it's name (Greatest of All Time). We would use the other BLOB plays throughout the game to set up the Goat play... and the success rate for this play is just incredible. First of all, the key screener (the point) defender rarely helps or switches on the play based on the angle, position and the fact that typically the point guard is guarded closely on the inbounds. Second, the scissors screen is RARELY if EVER defended well because teams do not see it often and therefore don't practice against it. 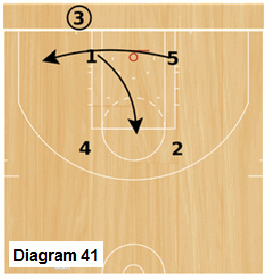 On this play (Diagram 41 & 42), 5 again clears to the short corner... 1 shoots up to the foul line and a scissors cut is executed by 4 and 2. It is critical that 2 is the first cutter AND that 4 times his cut right off the back of 2. We have found that we usually get both cutters wide open on this play... and almost always the second cutter (4 on this play).